Who doesn’t love a cupcake? Who isn’t a fan of a cookie? How about both, at the same time, with frosting on top? 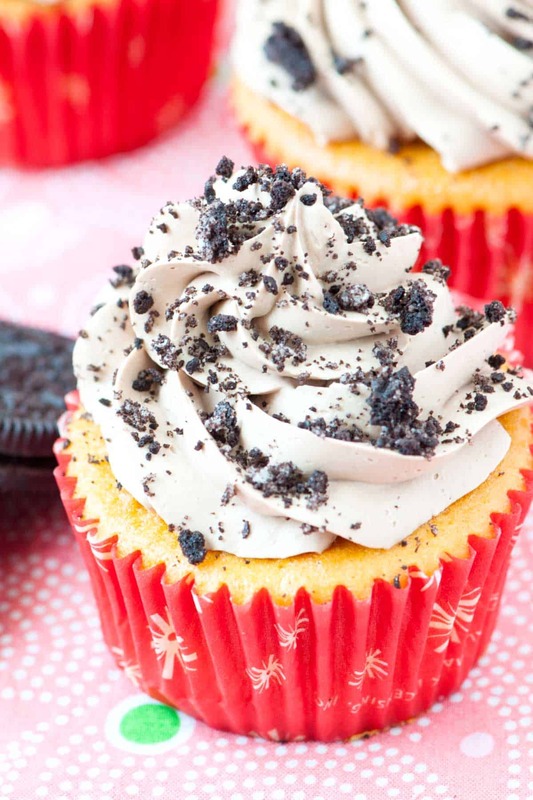 Jump to the Oreo Stuffed Cupcakes with Nutella Buttercream or read on to see our tips for making them. A few weekends back, we were invited to a BBQ that we knew would host many kids. Not having any of our own and not concerned about the sugar high that would liking hit, we decided to bring these Oreo-stuffed cupcakes with Nutella frosting. They were a hit. Since this was just for fun, we went for a boxed cake mix topped with Italian Buttercream. The buttercream is a bit of extra work, but so incredibly delicious, creamy and not-too-sweet. To make Italian buttercream you will need egg whites, sugar and butter. Then you can play with flavors, chocolate, colors, etc. We added Nutella to ours. Whip the egg whites until soft peaks form – this means that when you pull the whisk out, the mixture falls just slightly over itself. With the mixer on medium speed, slowly pour the sugar syrup into the whipped egg whites. Continue to whip the egg white and sugar mixture until completely cool (about 12 to 15 minutes). Whip softened butter into the cooled egg white and sugar mixture. 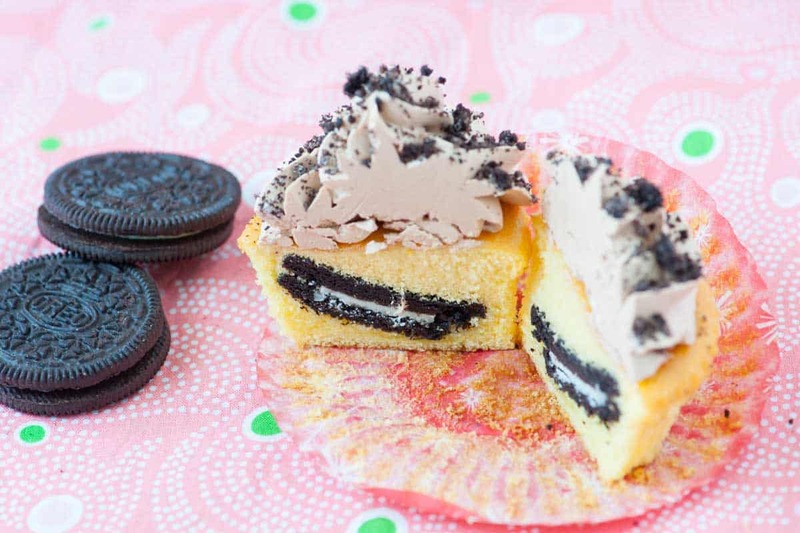 We place an Oreo cookie into the middle of each cupcake. Feel free to use your favorite cookie. The Nutella buttercream is bit more complicated, but worth the effort. It’s so light, smooth and creamy. Make cupcakes by following the box instructions. Fill each cupcake liner with batter a quarter full, place one Oreo cookie into batter then continue to fill with cake batter until 3/4 full. Bake per box directions then cool on a wire rack. Crush the remaining 4 cookies and set aside for decorating the finished cupcakes. Add sugar and water to a medium saucepan. Heat over low heat, stirring with a metal spoon, until the sugar has dissolved and the syrup is clear. Increase heat to medium-high and let the syrup come to a boil. Meanwhile, place the egg whites into the bowl of a stand mixer fitted with the whisk attachment. Beat egg whites until they have soft peaks — this means that when you lift the whisk the egg whites will softly fall over itself. When the sugar reaches 240 degrees F, immediately remove the pan from the heat and, while the mixer is running, slowly drizzle the hot sugar syrup into the bowl with the egg whites. Aim to drizzle the syrup close to the whisk, not down the side of the bowl. When all the syrup has been added, continue to whisk until the bowl feels cool to the touch, about 15 minutes. When cooled, while whisking, add the butter, one cube at a time, beating after each addition. Beat in the vanilla and Nutella until the buttercream is smooth and shiny. 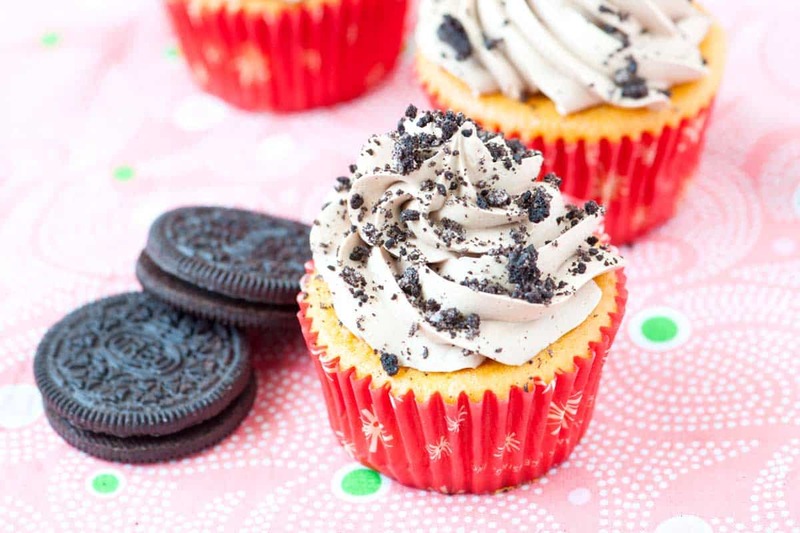 Pipe or spread buttercream onto cupcakes and top with Oreo cookie crumbs. Make-ahead: Refrigerate the buttercream in an airtight container or a resealable plastic bag in the fridge for up to two weeks. Or freeze for up to two months. When ready to use, allow the buttercream to come to room temperature and beat until it is smooth and spreadable again. Hi. I was trying to do the buttercream and my question is, is there supposed to still be butter chunks left after 10 min of mixing in low/med speed??? Hi Ashley, not really. Was the butter you used at room temperature? Sounds wonderful. I’ve got a recipe for oreo stuffed chocolate chip cookies. the cupcakes were great however was not certain about the frosting. It tasted good, but with 5 1/2 sticks of butter it made about 6 cups of frosting!. 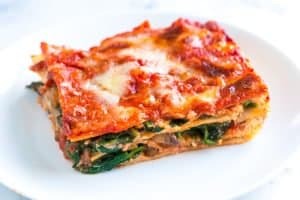 Am wondering if i did something wrong or if the recipe was wrong. it was good however. Why was there so much frosting! I just finished making these for a friend’s b-day tomorrow! OH MY GAWSH! I of course sampled one and it was amazing! I’m going to blog about it and link to you 🙂 Thanks! Jessica and Lisa, Thank you so much! The cupcakes were pretty awesome, you should have see the kids faces when they realized what was hidden inside! Looks fabulous! I recently made Oreo Bars … rich brownie base topped with Oreo crumbles and vanilla glaze. 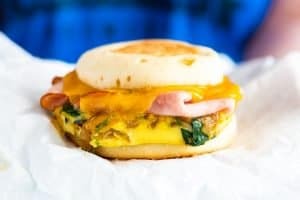 Another yum! Looks great! I recently made & posted about Oreo Bars … rich brownie base topped with crumbled Oreos and vanilla glaze. Another yum! I’m in an Oreo phase right now and anything Oreo is making my stomach growl! Love the crumble accent on top. Italian buttercream is definitely well worth the effort. Add some Nutella? Well, that sounds like the perfect combination to me.